After World War II, foreign affairs began to play a more important role than ever in the lives of American citizens. The United States and its allies competed with the United Soviet Socialist Republics (USSR) and its allies for political and economic control of the world. Known as the Cold War, this rivalry between the U.S. and the Soviet Union shaped almost every aspect of international politics, as well as many domestic concerns. The Cold War ended with the fall of the Berlin Wall in 1989 and the dissolution of the USSR in the early 1990s. In the late 1940s, people in Wisconsin were divided over issues such as the United Nations, support for European recovery, and the growing power of the Soviet Union. But when post-war Europe divided into Communist and Capitalist camps and China's communist revolution succeeded in 1949, public opinion shifted to support democracy and capitalism against communist expansion. That tension reached a climax in Korea. Overshadowed by WWII, the Korean War has often been called America's "forgotten war." But, like Vietnam, it was part of a larger Cold War struggle to extinguish communism. 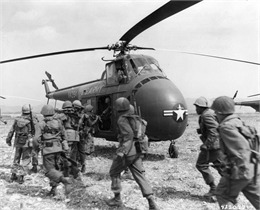 In 1950, North Korean communist troops invaded South Korea, which was an American ally. Seeking to protect South Korea and prevent the spread of communism in Asia, President Harry Truman sent General Douglas MacArthur to command the United Nations forces. The Korean conflict lasted three years (1950 - 1953). It was dominated by self-serving negotiations and stalemates that delayed the armistice and cost thousands of lives. 132,000 Wisconsin citizens served in Korea. For the first time in American history, military units were racially integrated. Mitchell Red Cloud, a Native American from Hatfield, was one of five men from Wisconsin to receive a Congressional Medal of Honor in Korea. Communism required tight restrictions on personal freedom and government ownership of business. It threatened the American ideals of individual liberty and free enterprise. 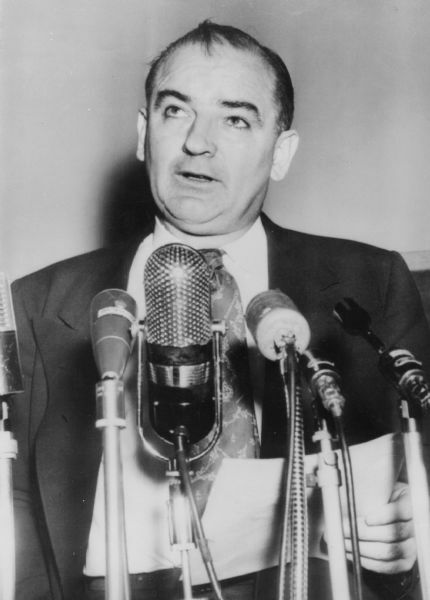 Communist expansion in Eastern Europe and Korea fueled Americans' anxiety that their way of life was under attack and launched the career of Wisconsin senator Joseph McCarthy. After several uneventful years in the Senate, McCarthy made headlines when he announced in a 1950 speech in Wheeling, West Virginia, that he knew 205 communists were currently working in the State Department. Since American men and women were preparing to sacrifice their lives in combat against a communist enemy in Korea, McCarthy's speech garnered great publicity. Capitalizing on people's fears of communism, McCarthy launched a public campaign to eliminate the supposed communist infiltration of government and foreign policy. His pronouncements catapulted him to national prominence and provided a strong platform for his re-election. McCarthy was re-elected in 1952 and chosen as chair of a Senate Permanent Investigations Subcommittee. He exposed communists and their sympathizers in government and in every facet of American life. Under his leadership, the Subcommittee interrogated more than 500 people. McCarthy's accusations were often unsubstantiated, but in a climate dominated by fear he grew in popularity anyway. McCarthy and his staff often refused to reveal their sources of information. Simply being called before his committee could ruin a person's career. Afraid of being called communist sympathizers, many leaders of labor unions and professional organizations joined the Red Scare hysteria of the early 1950s. Some intellectuals and activists refused to answer his questions or appear before his committee despite the threat to their personal well-being. Several famous Hollywood producers and scriptwriters were "black-listed" by their employers for refusing to co-operate with the committee. Despite his massive popularity, McCarthy's accusation in 1953 that the military was harboring communists led to his downfall. TV commentator Edward R. Murrow exposed his tactics and publicly denounced his actions as a threat to American's core democratic values. In December, 1954, the Senate officially rebuked McCarthy for "conduct unbecoming a senator." Though only in power briefly, McCarthy attained world recognition and symbolized the frenetic anti-communism that gripped American foreign policy in the 1950s. The Cold War and the spread of Communism in Eastern Europe, China and Korea prompted the United States to increase its defense spending. As U.S. companies began to exploit foreign resources such as Mideast oil and market their goods to Third World countries, a strong, permanent military became important to the U.S. government. Domestic companies began to negotiate defense contracts that fueled American prosperity and grew the American middle class. But the country's economy soon became dependent on military expenditures. President Dwight D. Eisenhower warned America about the nation's growing "military-industrial complex" when he left office in 1960. William Proxmire, who succeeded McCarthy as a Wisconsin senator, gained a reputation for closely scrutinizing defense contracts and opposing exorbitant military contracts.